I am so lucky to live on the fabulous West Coast surrounded by so many like-minded fitness & wellness enthusiasts dedicated to moving their bodies everyday and nourishing them with life-giving food. Since I started this blog in 2009 I have met with so many people right in my own backyard who are not only personally dedicated to their health & wellness, but who are also creating awesome fitness products that help everyone get fit & healthy and live their best life. This week I was blessed to spend some time with Darren Shane of Astone Fitness for an in-depth introduction to the Human Trainer Suspension Gym. The Human Trainer (HT) is a fitness tool that allows you to perform strength, balance, and flexibility exercises using your own body weight as resistance. Through it’s very unique and simple suspension and handle system you can perform hundreds of movements with varying workloads. The two-strap system is usable at home, the gym or outdoors. The straps can be anchored to a door, ceiling or wall mounts, a pole, a truss, chin-up bar or almost any solid and sturdy object. Clip-on handles and foot cradles make for a versatile training tool with hundreds of exercises from squats, pushing , pulling, plank and many more…. (No kidding the exercise manual is 125 pages long). The clip and go caribiner system makes transitions from one exercise to the next super quick and accurate. You can do a row exercise with the handles at the very bottom and follow it with a set of dips within a few seconds. This is great for Crossfit or circuit style workouts that require quick and accurate transitions. The width placement of the double straps can be adjusted to accommodate different user sizes. This also creates a natural line of pull since line of force comes from directly behind/or in front of the body instead of from a single anchor point. The included foot cradles allow for so many additional exercises for the hamstrings, abdominals, glutes, & hips. I can throw my straps into my gym bag or suitcase and enjoy a great workout outdoors or on the road. 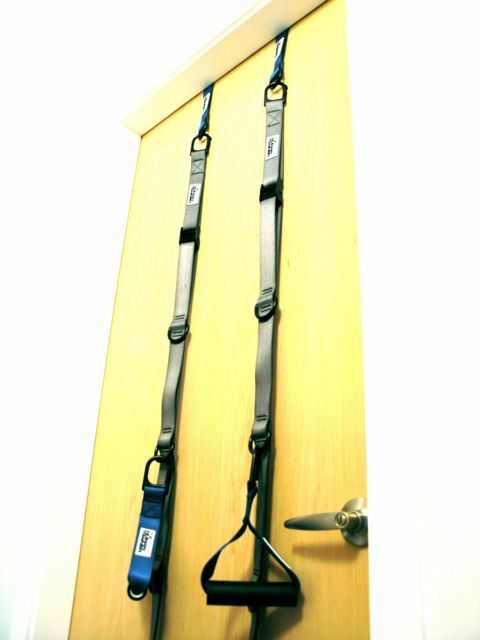 Anchor to a hotel room door or a tree in the park (make sure you get the versatility straps too). There are many exercises I can do with my beginner, de-conditioned or injured clients. The Human Trainer allows me teach primal movements such a squats, push-ups and pulls to even the most elderly. The Human Trainer allows me teach people primal movements starting with zero workload gradually adding resistance as they feel comfortable. This week alone I used the HT in 2 very unique ways with clients. I used it to teach a 60-year-old woman to do deep squats. She performed a full set of 15 beautiful reps. I also used the HT to help a women with a fused ankle do full squats to help strengthen her under-used quads. Both felt secure using the HT enabled them to do full squats. The Human trainer is great for balancing circuit training classes that too often feature mostly pushing exercises and where minimal space and equipment is an issue. It is often difficult to include pulling stations in an outdoor or studio class however the HT is easily transported and clipped in to complete a circuit that is muscle balanced. The straps serve as a great way to perform a number of stretches. My favorite stretches are the pec stretch and quad stretch. Using the straps requires many stabilizers muscles since there is not a fixed axis like there is with traditional strength training machines. 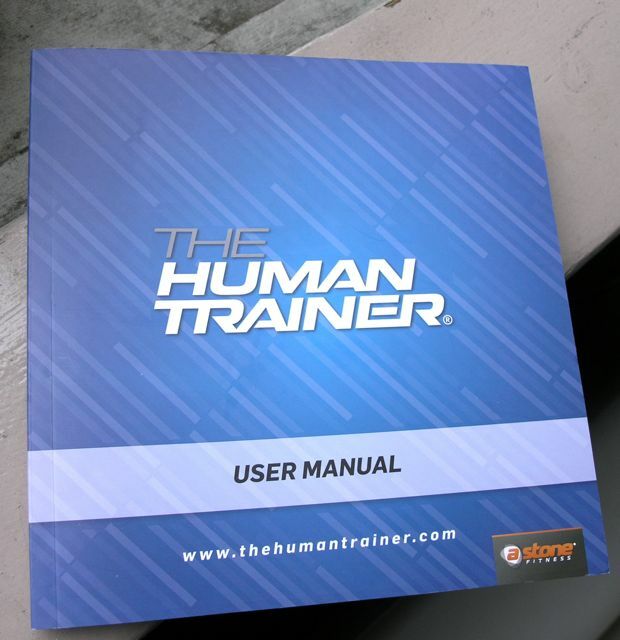 If you are accustomed to a 1 page poster of exercises that generally comes with a piece of fitness equipment, get ready for the Human Trainer manual, it is a 125 page, full colour glossy manual that is just plain gorgeous. Everyone really. Athletes, beginner exercisers, youth, elderly, rehabilitation. Great for the home workout movement and for frequent travellers. The Human Trainer Suspension Gym Full Potential Complete Kit: Main Straps, Handles, Door Anchor, Versatility Anchor, Travel Bag, Ceiling Mounts, Ab Straps, Circuit7 DVD and Manual. This week I am preparing for some small group training sessions and a circuit class using a set of 4 Human Trainer Systems. I’ll let you know how it goes! What is your favourite suspension training exercise?